Moving house is a very stressful experience and the process can be demanding. From hiring removal services and packing to contacting various suppliers to change personal details, the ordeal can become hectic. So image how taxing it can be if you are moving property with pets? The transition needs to be carefully planned to ensure your furry friends do not get frightened or upset. Organisation is important to make the move as stress-free and easy as possible. Animals are bound to become somewhat alarmed as their daily routine gets interrupted but you can deploy various techniques to prepare in advance. If you are moving house this summer, check out these amazing tips from Robinsons. Make your pet feel comfortable and happy with a new toy or edible treat. This will keep them entertained during the transit and distract them from everything going on. If your pet is micro-chipped, make sure you update the details of the new address and don’t forget to get a new name tag made with the correct address and contact number. Before you move, get your local vet to carry out a routine health check to ensure everything is in working order. If your pet is prone to anxiety or travel sickness, enquire about medication. 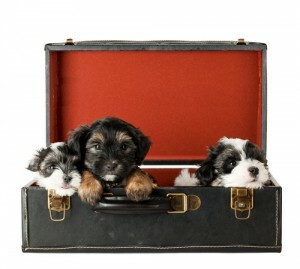 Pet-proof the new home before you move your dog or cat there. Check that the fences and gates are closed off and that there is no way they can escape. When packing all your belongings away, don’t forget to leave a water and food bowl out. If you are moving a long distance, your pet will require water during the transit especially if the weather is warm to avoid dehydration. But if you are travelling a far way, try to evade giving too much food right before the move or they may get an upset tummy. You may decide to purchase new toys and equipment for your dog or cat for the new house. Often with a move it is best to start a clean slate and buy a new bed but refrain from putting these into place at the start. They will feel uncomfortable and restless in new surroundings until they settle and they will appreciate their old items to put them at ease. When the removal team come to the house to help you move, try and see if a neighbour or relative can look after your pet, especially if it is a dog. With doors being left open and strangers walking in and out of the property, dogs can get distressed or lost. If you can, lock them in a room and open up the window for some fresh air, or tie them to a long chain in the garden. If you have a question about anything regarding your move or you need some expert guidance, ‘make an enquiry’ today.